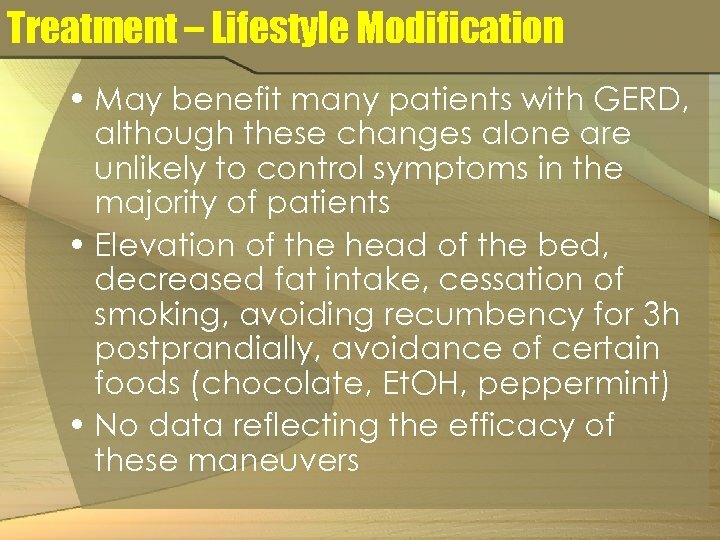 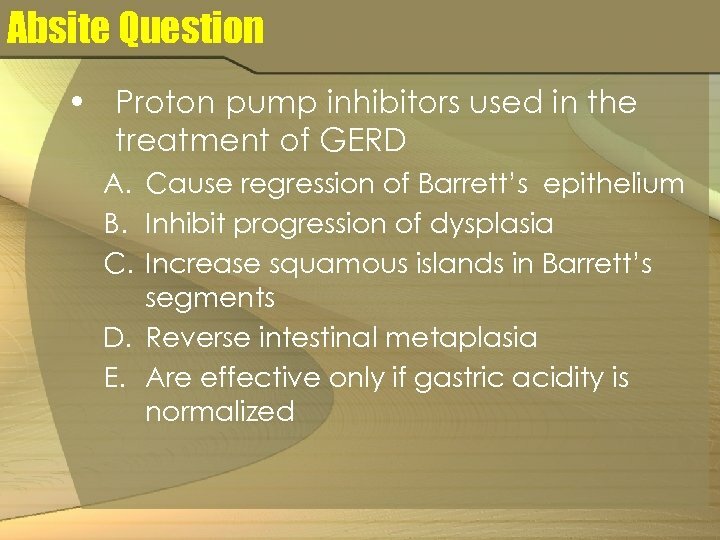 Absite Question • A 60 year-old otherwise healthy man has symptomatic GERD that has not responded to medical therapy, including PPIs. 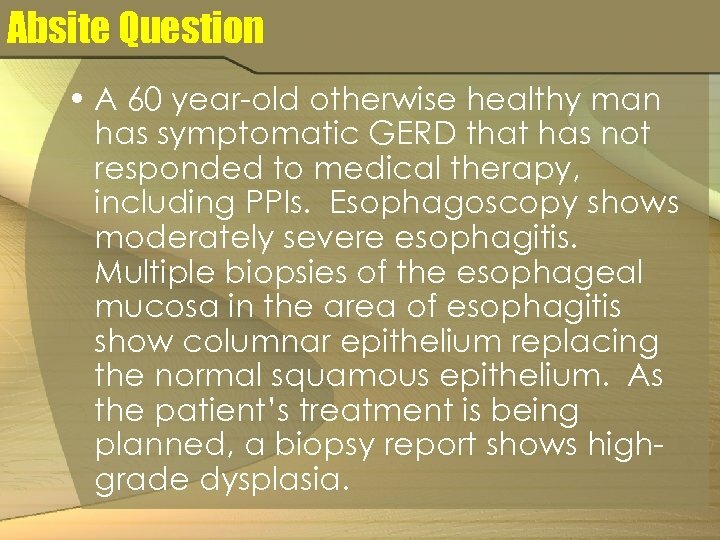 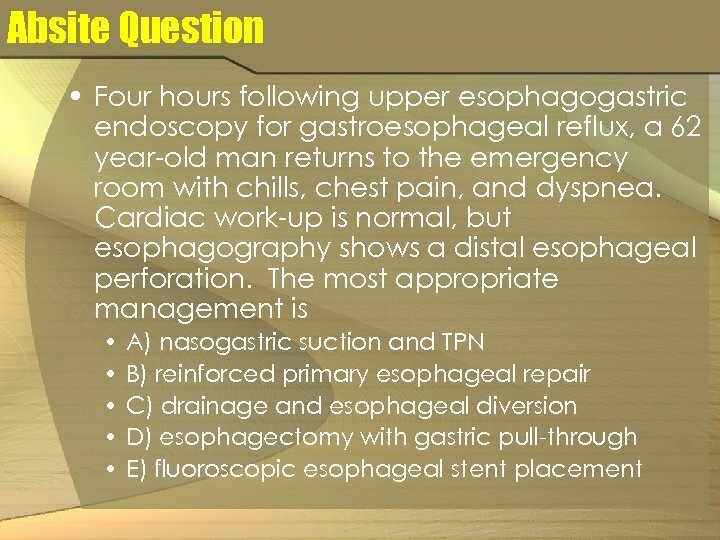 Esophagoscopy shows moderately severe esophagitis. 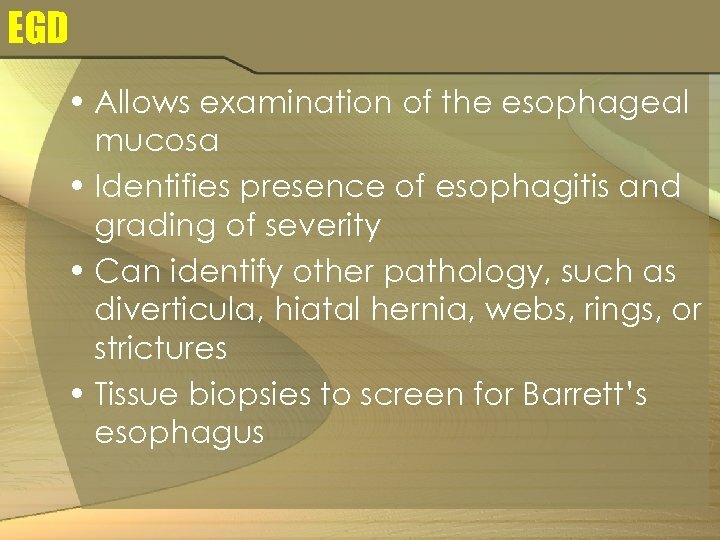 Multiple biopsies of the esophageal mucosa in the area of esophagitis show columnar epithelium replacing the normal squamous epithelium. 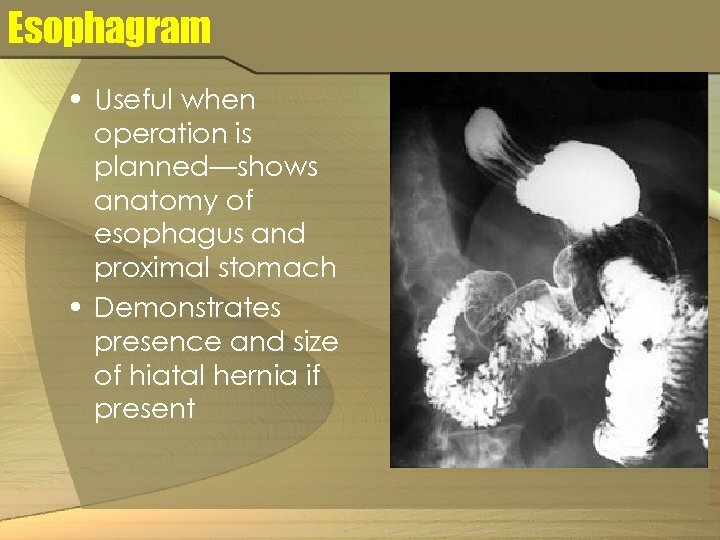 As the patient’s treatment is being planned, a biopsy report shows highgrade dysplasia. 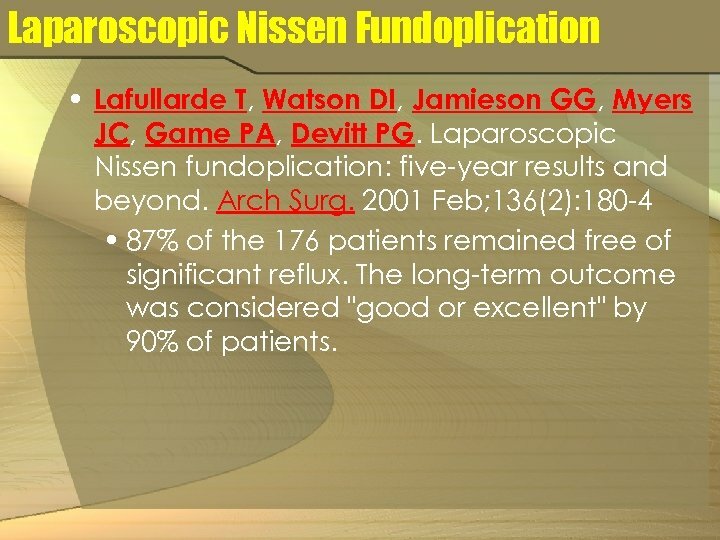 Laparoscopic Nissen Fundoplication • Lafullarde T, Watson DI, Jamieson GG, Myers JC, Game PA, Devitt PG. 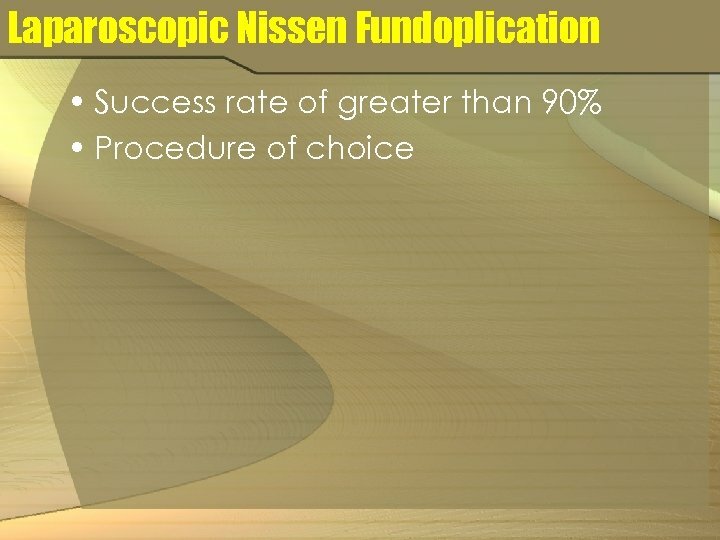 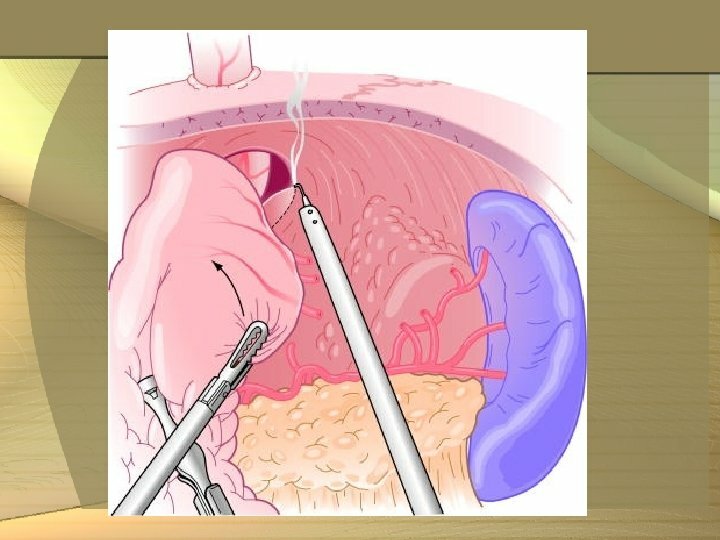 Laparoscopic Nissen fundoplication: five-year results and beyond. 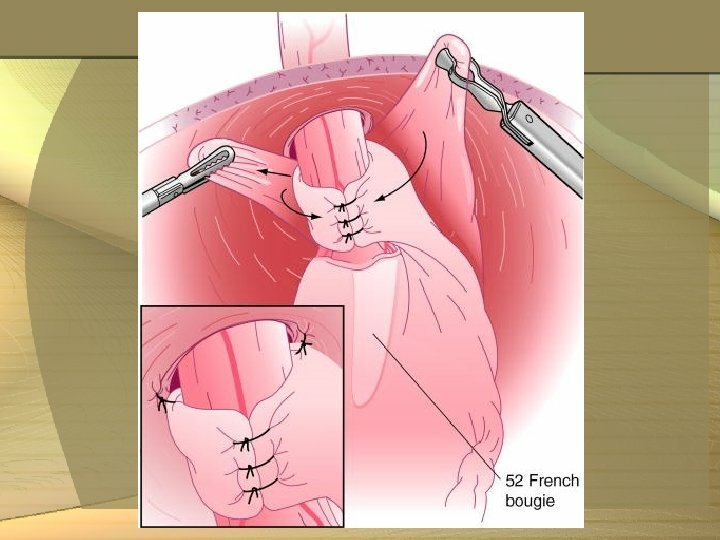 Arch Surg. 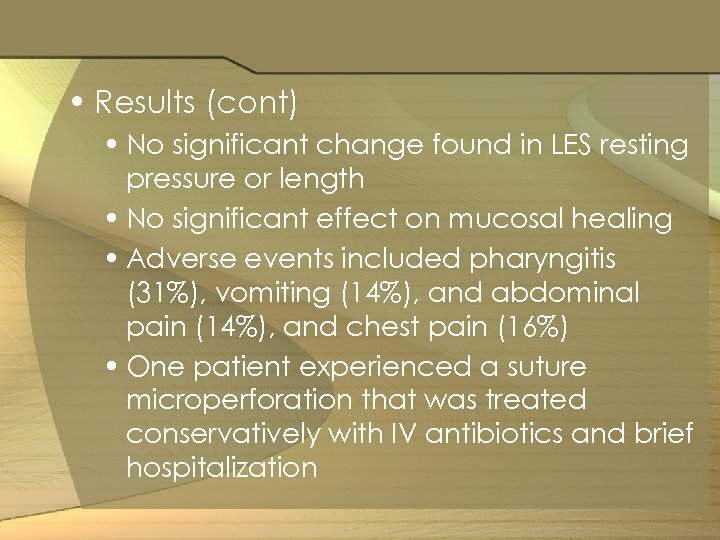 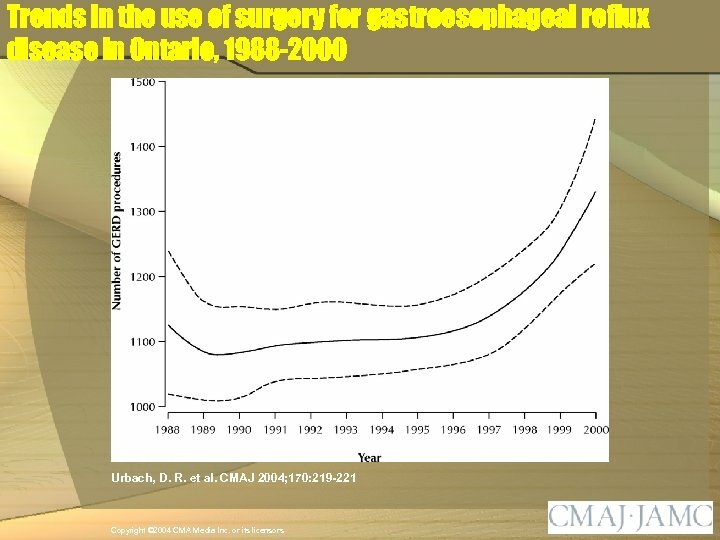 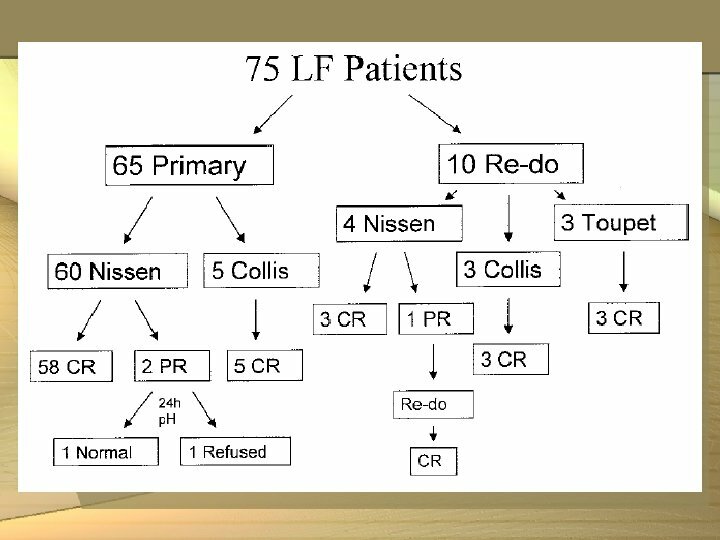 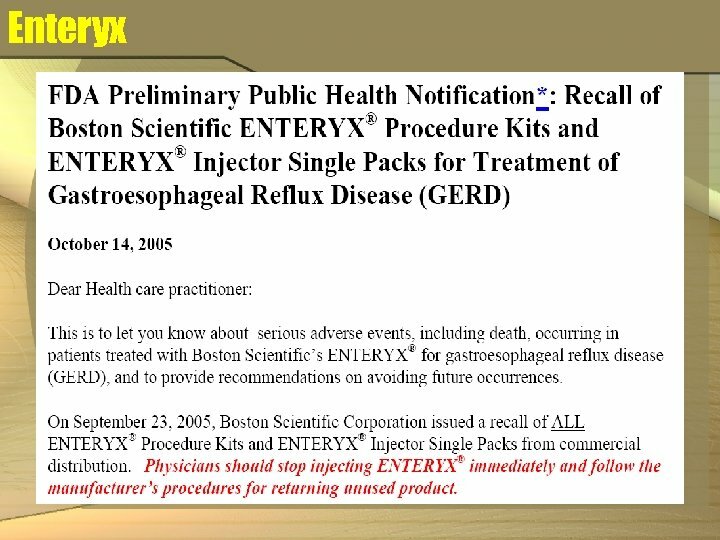 2001 Feb; 136(2): 180 -4 • 87% of the 176 patients remained free of significant reflux. 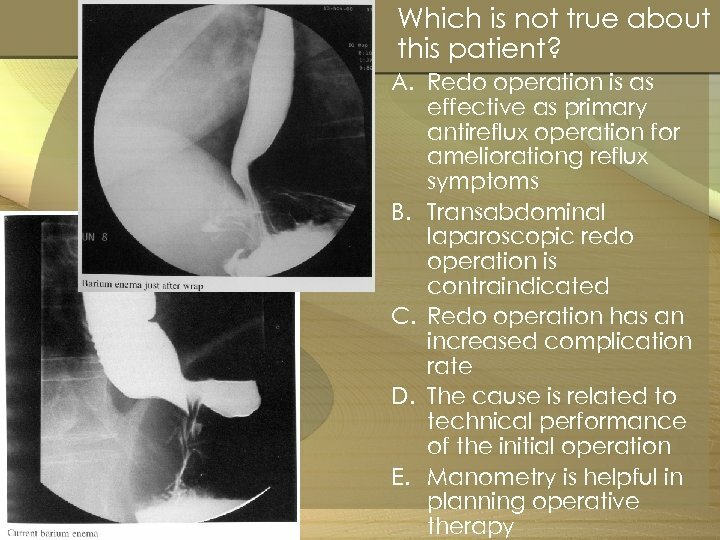 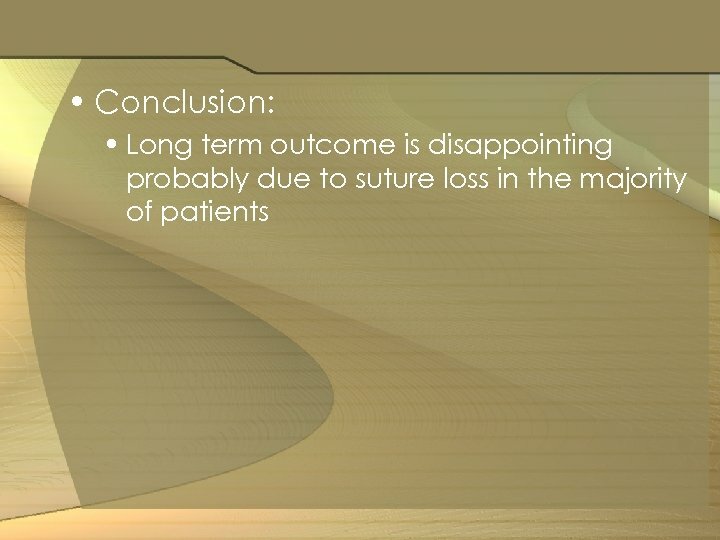 The long-term outcome was considered "good or excellent" by 90% of patients. 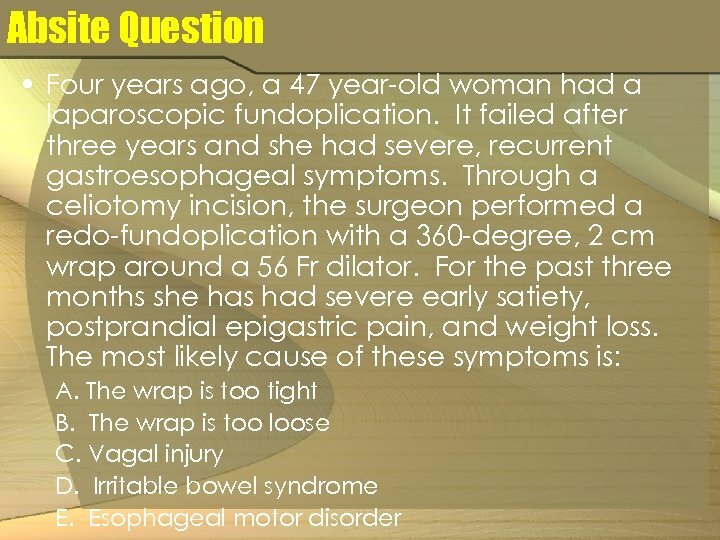 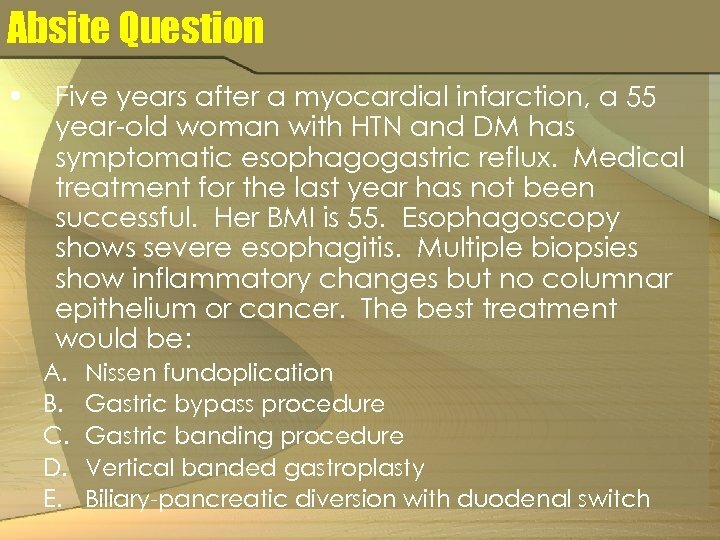 Absite Question • A 56 year-old man is seen 2 years after a laparoscopic Nissen fundoplication for GERD. 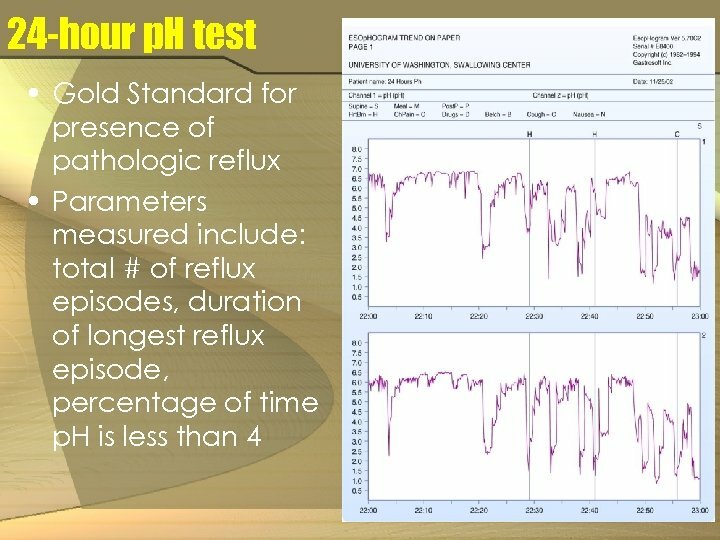 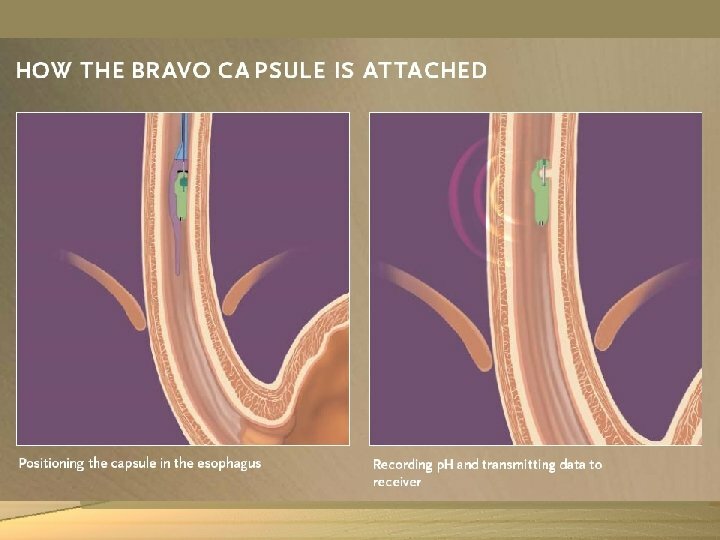 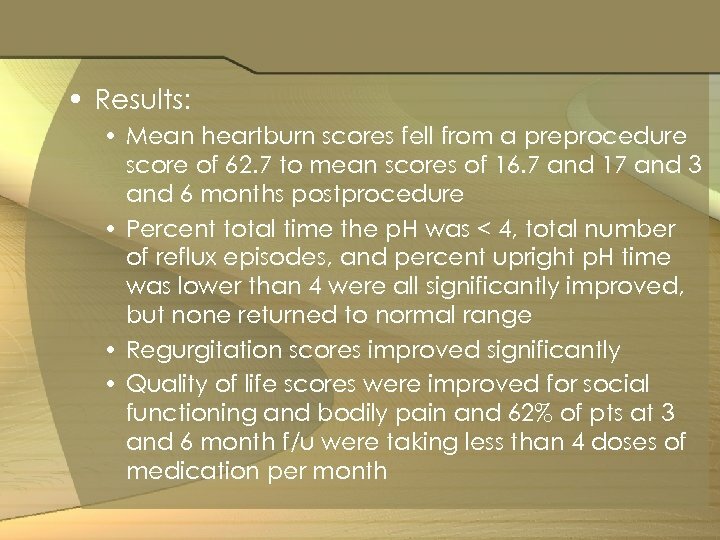 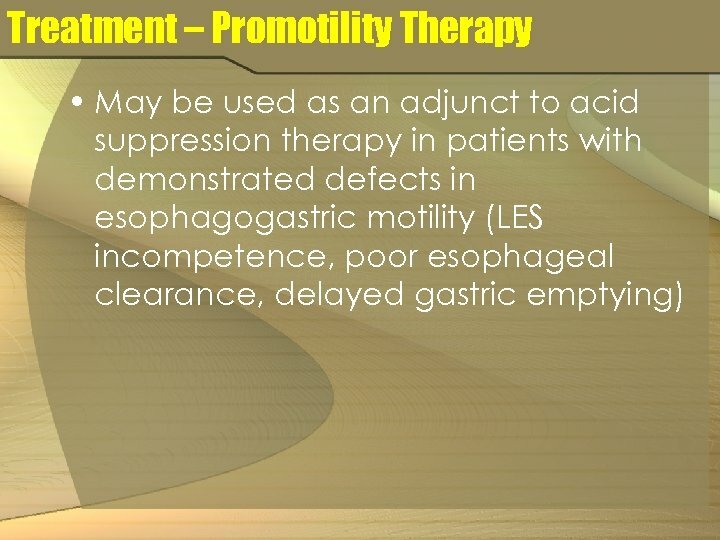 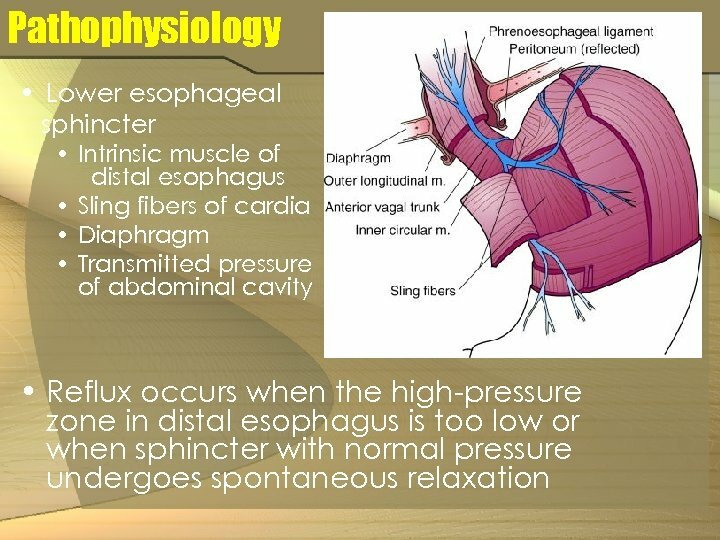 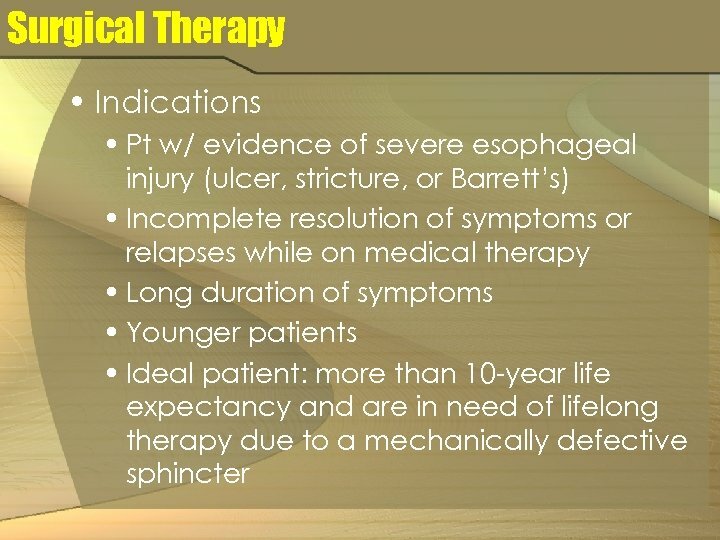 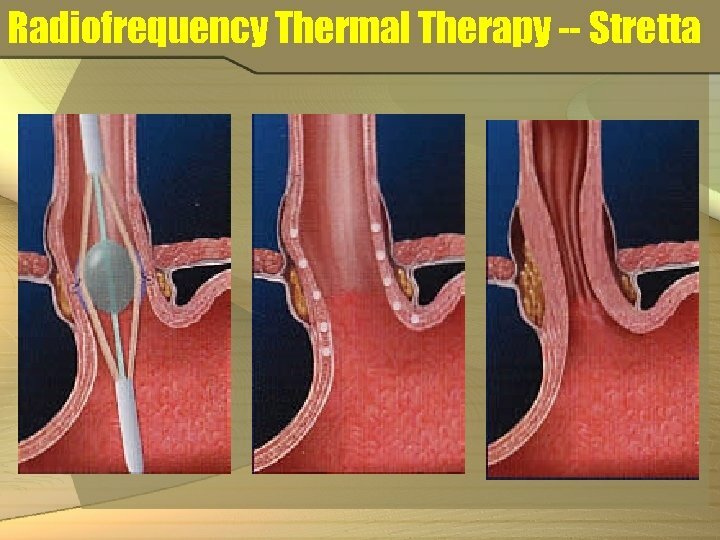 His pre-operative work-up 2 years ago demonstrated normal esophageal motility, and p. H probe testing showed that reflux was the cause of his symptoms. 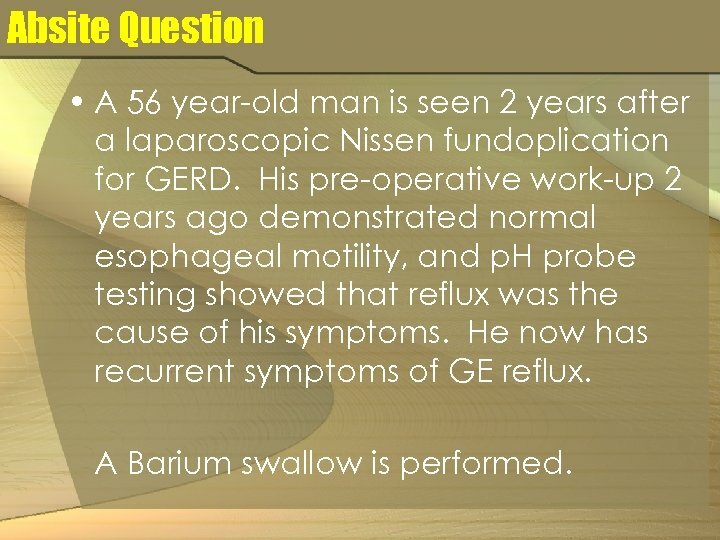 He now has recurrent symptoms of GE reflux. 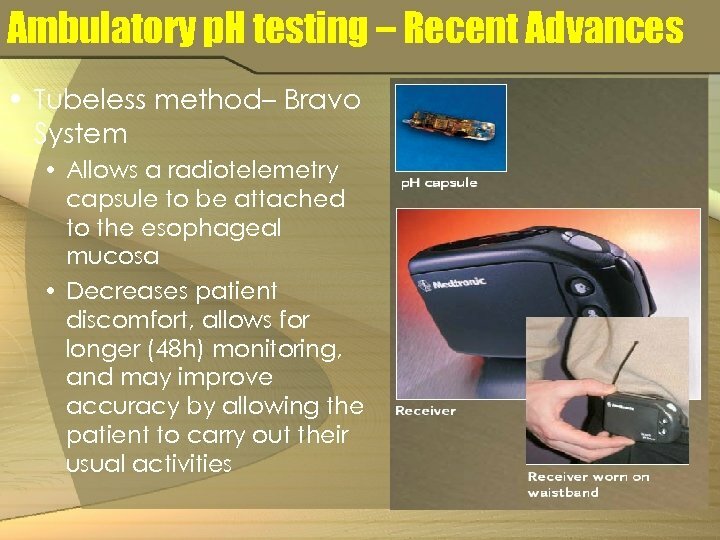 A Barium swallow is performed. 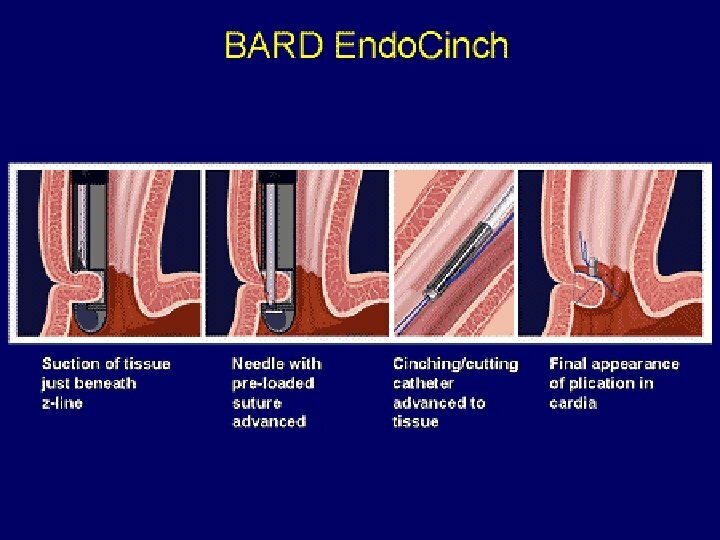 Endo. Cinch • Filipi CJ, Lehman GA, Rothstein RI et al. 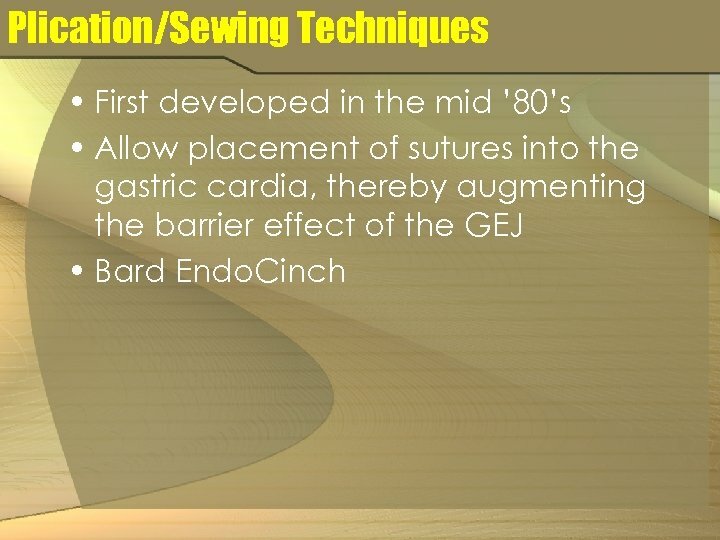 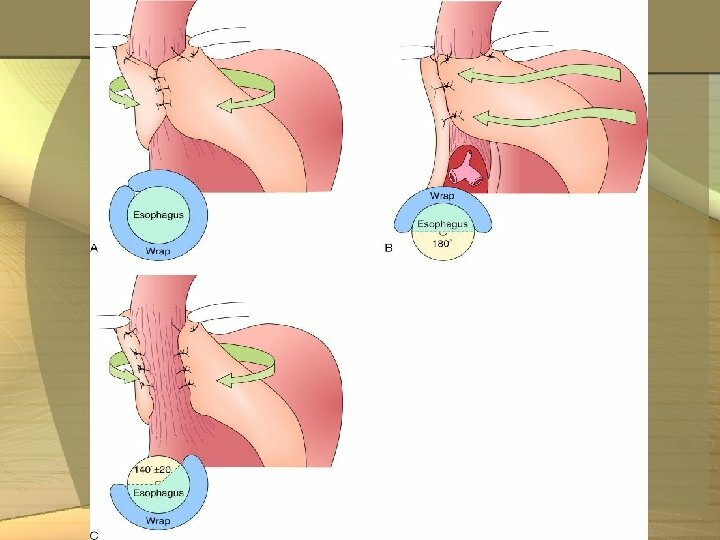 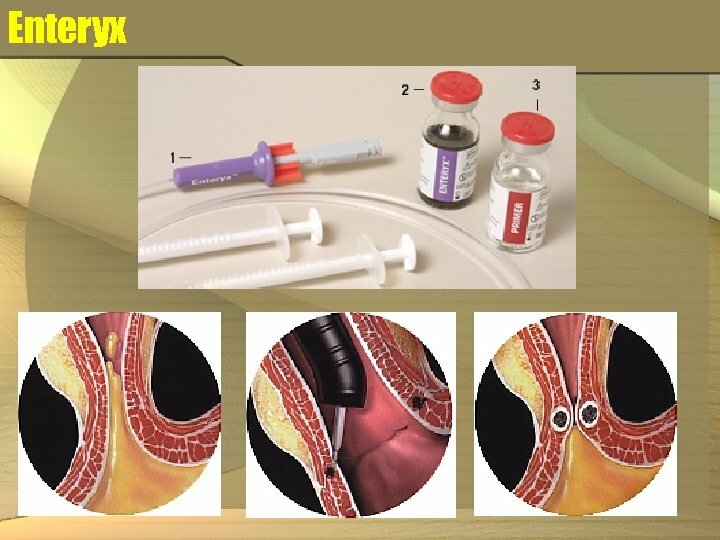 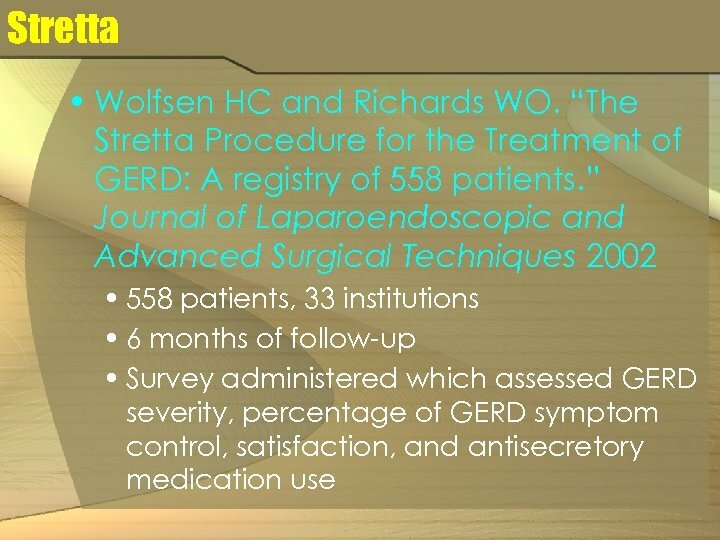 “Transoral, flexible endoscopic suturing for treatment of GERD: a multicenter trial. 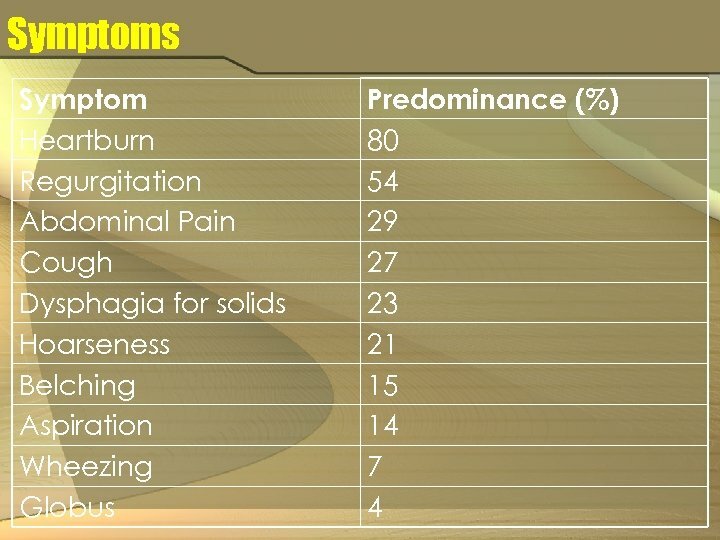 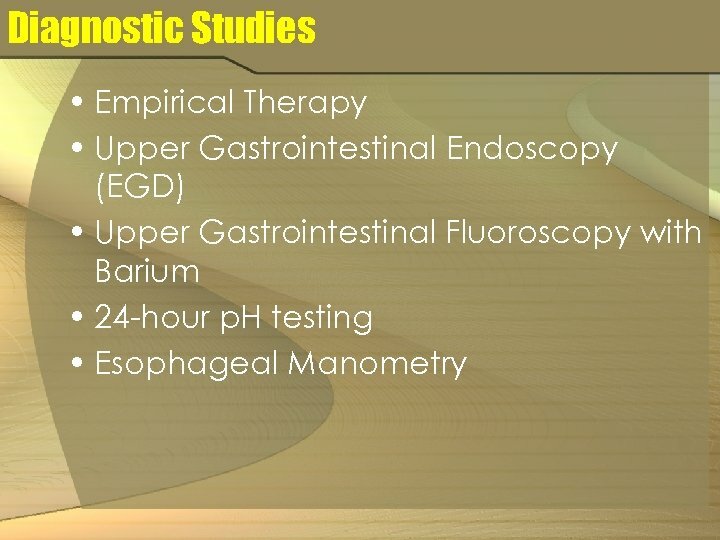 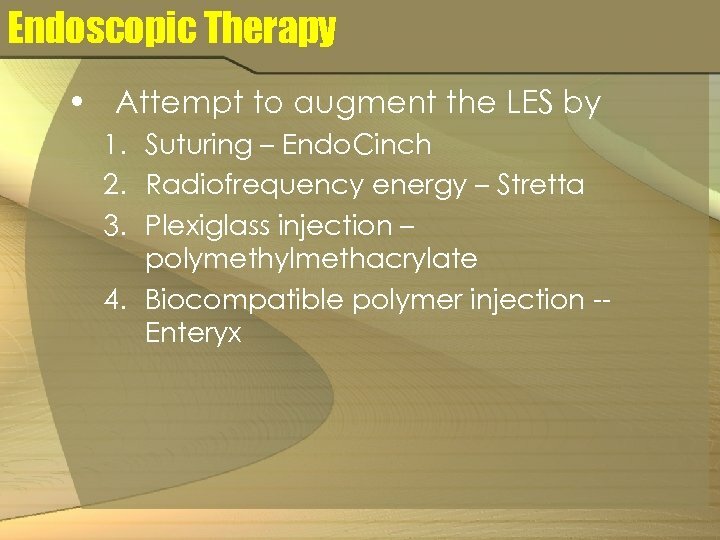 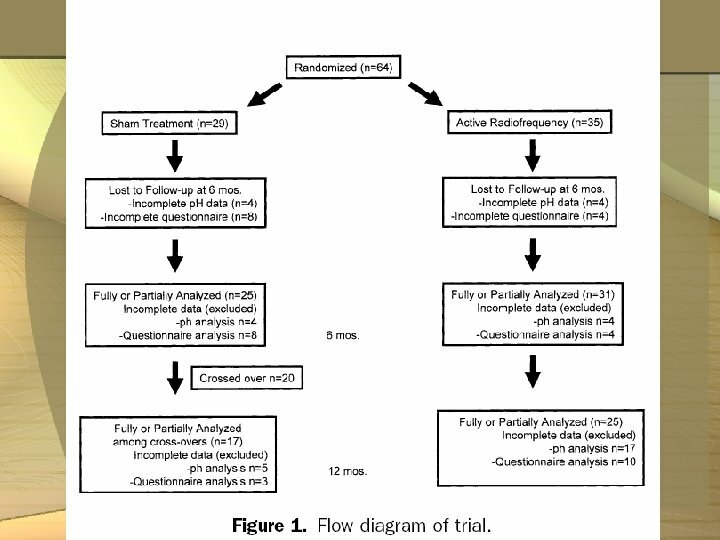 ” Gastrointestinal Endoscopy 2001; 53: 416 -22. 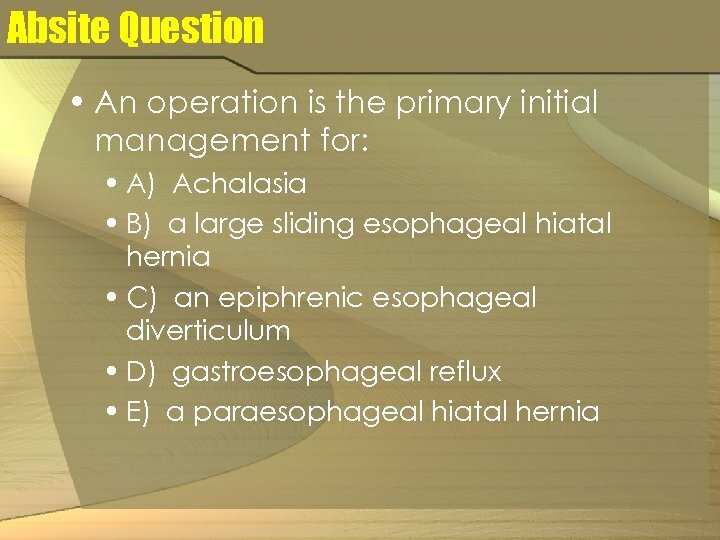 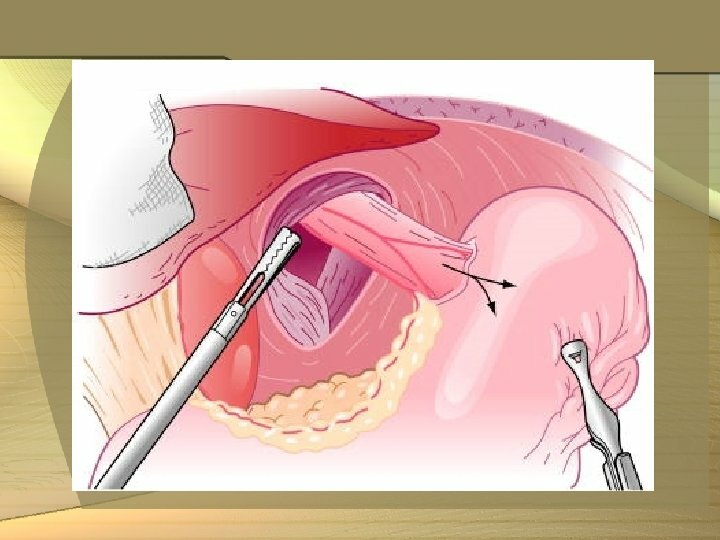 • Suggested that endoscopic gastric plication is a safe procedure and, at a 6 month follow-up, that 2/3 of pts undergoing the procedure were successfully treated. 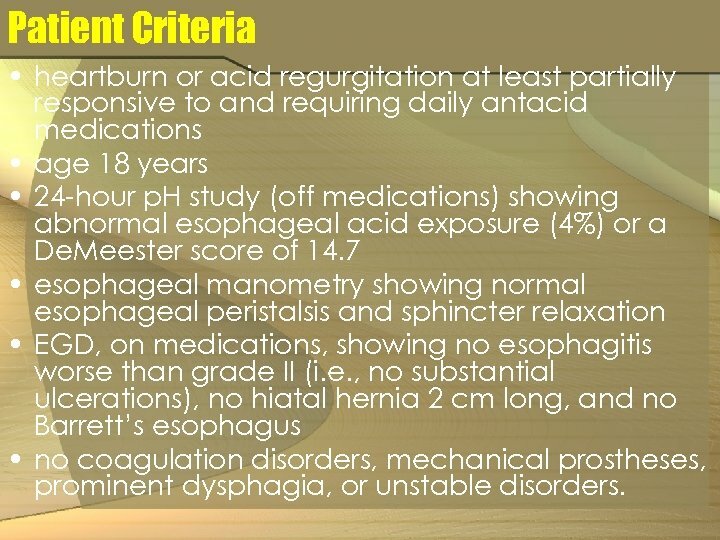 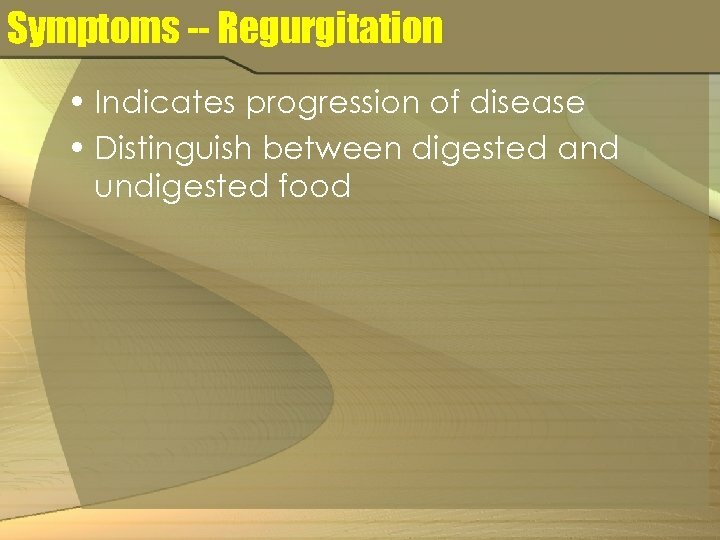 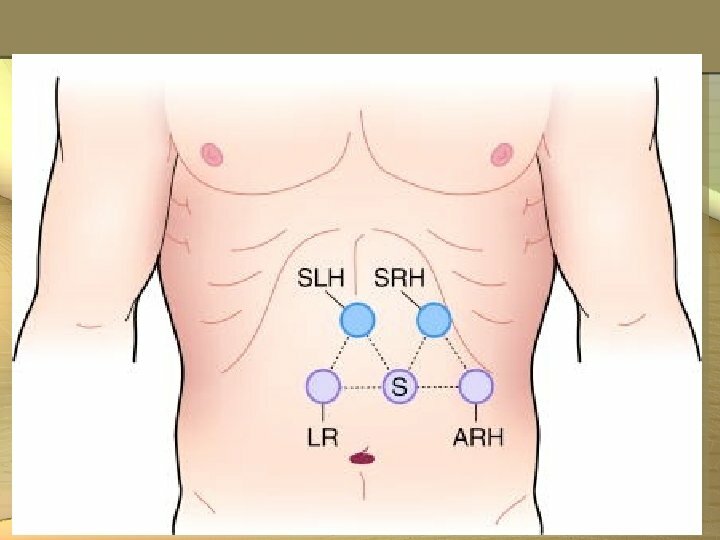 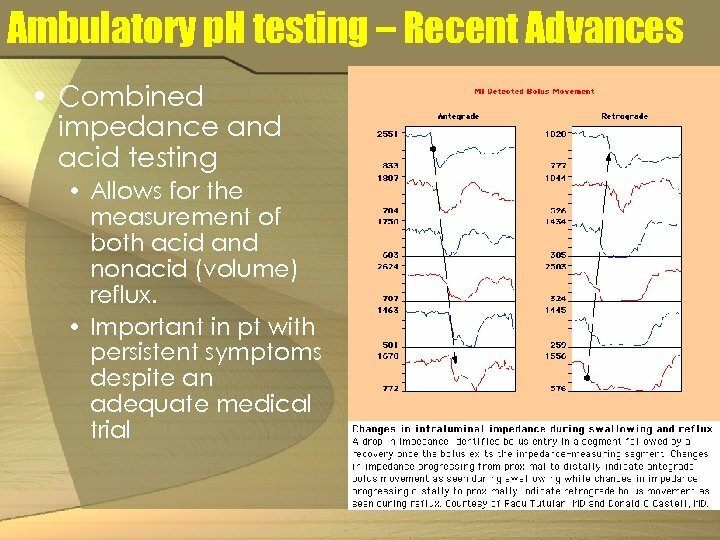 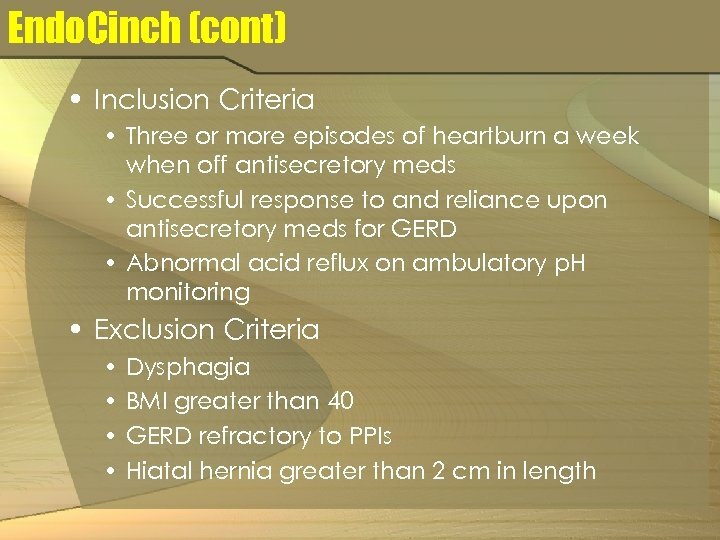 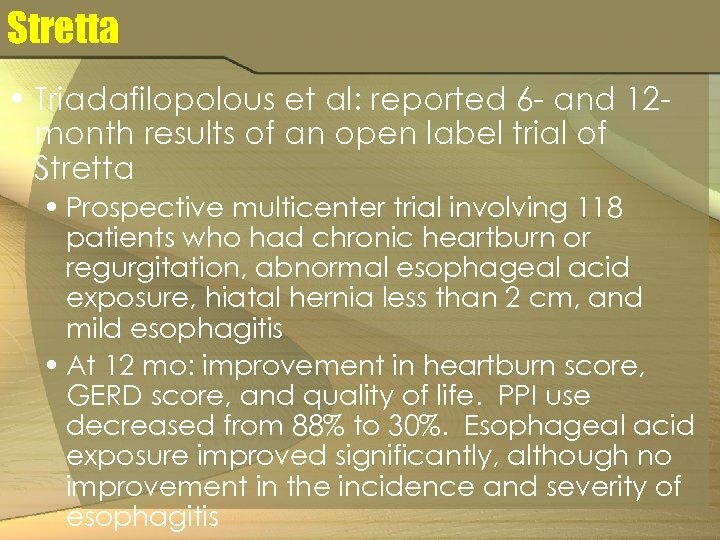 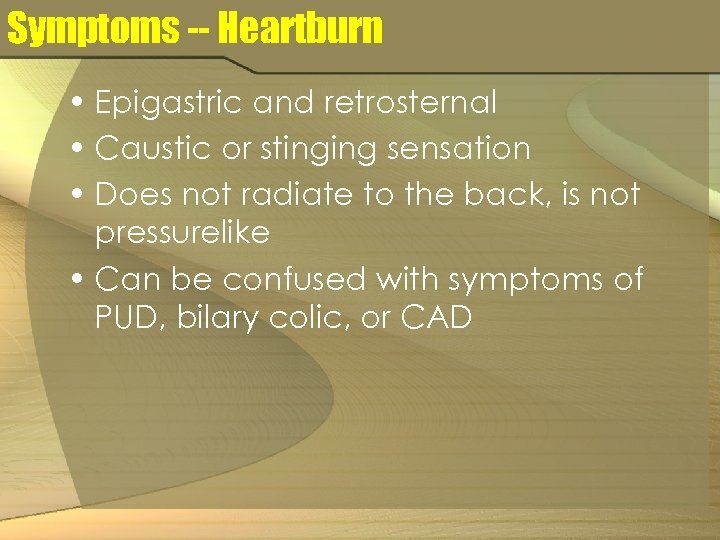 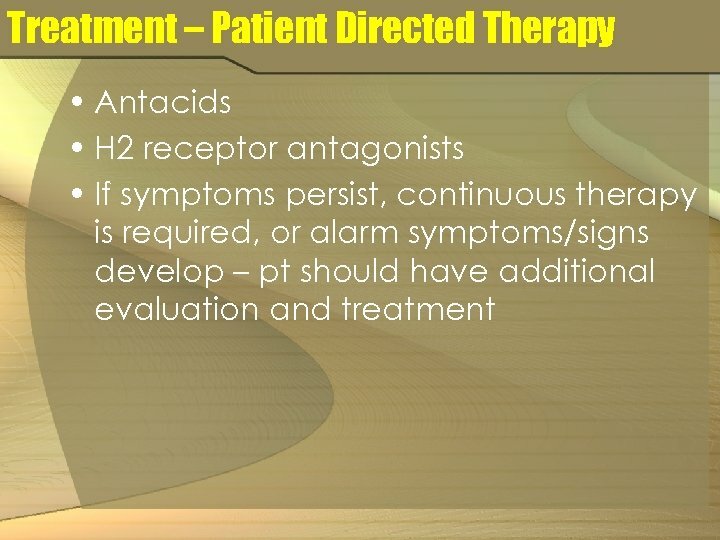 Patient Criteria • heartburn or acid regurgitation at least partially responsive to and requiring daily antacid medications • age 18 years • 24 -hour p. H study (off medications) showing abnormal esophageal acid exposure (4%) or a De. 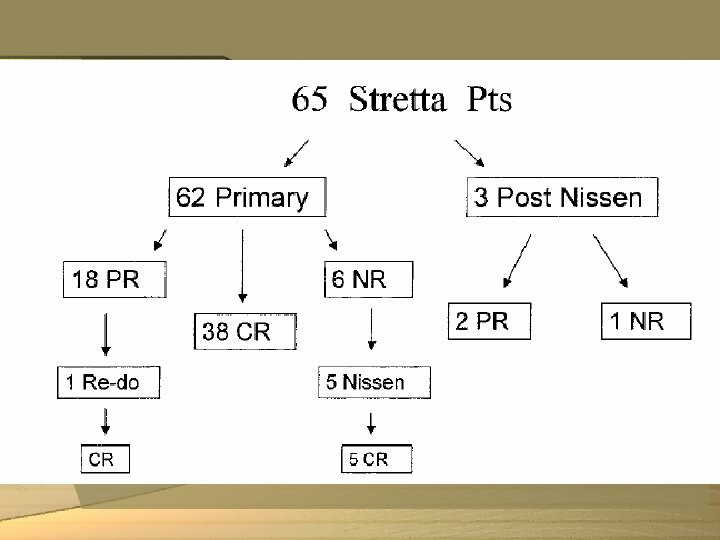 Meester score of 14. 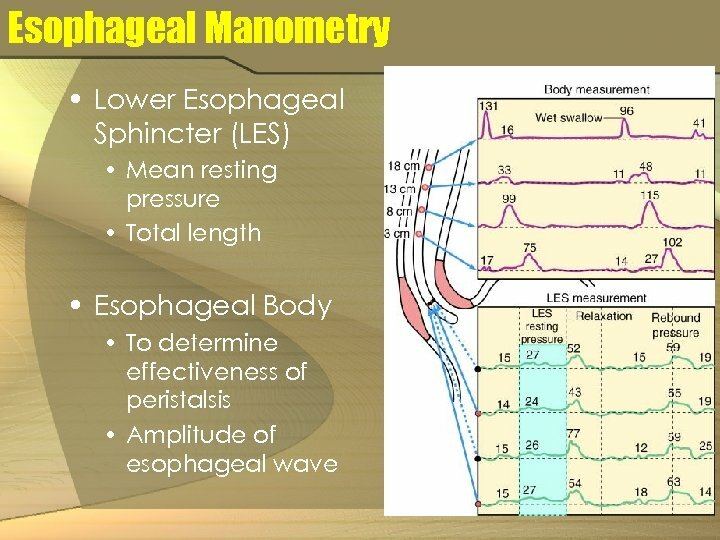 7 • esophageal manometry showing normal esophageal peristalsis and sphincter relaxation • EGD, on medications, showing no esophagitis worse than grade II (i. e. , no substantial ulcerations), no hiatal hernia 2 cm long, and no Barrett’s esophagus • no coagulation disorders, mechanical prostheses, prominent dysphagia, or unstable disorders. 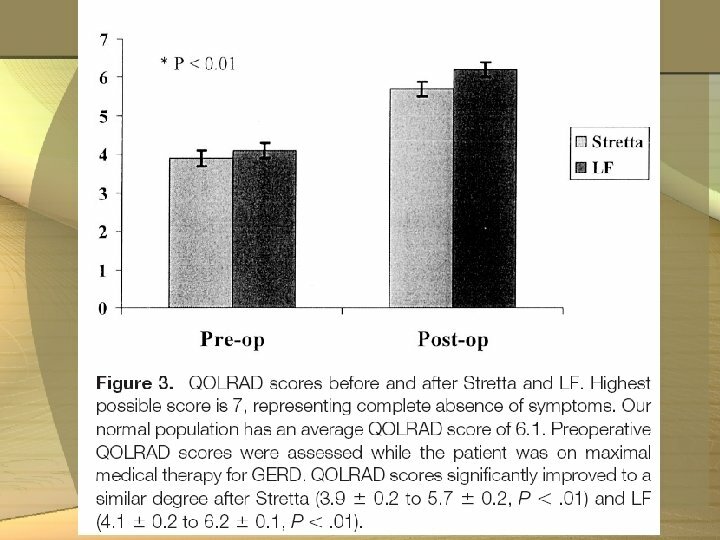 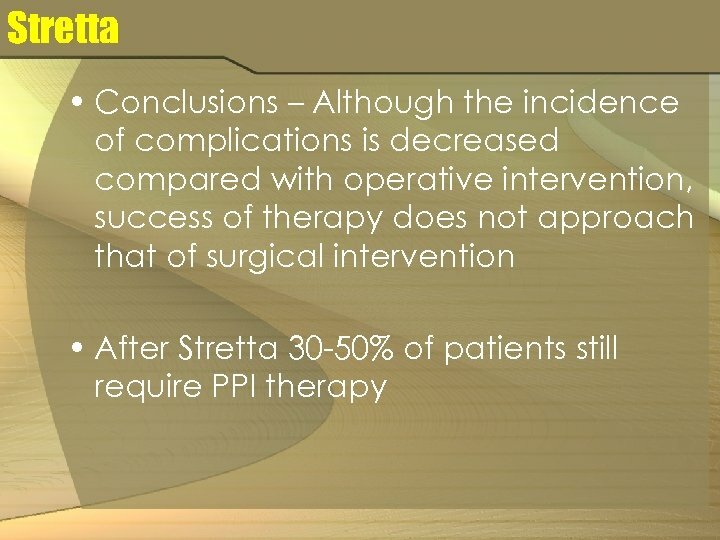 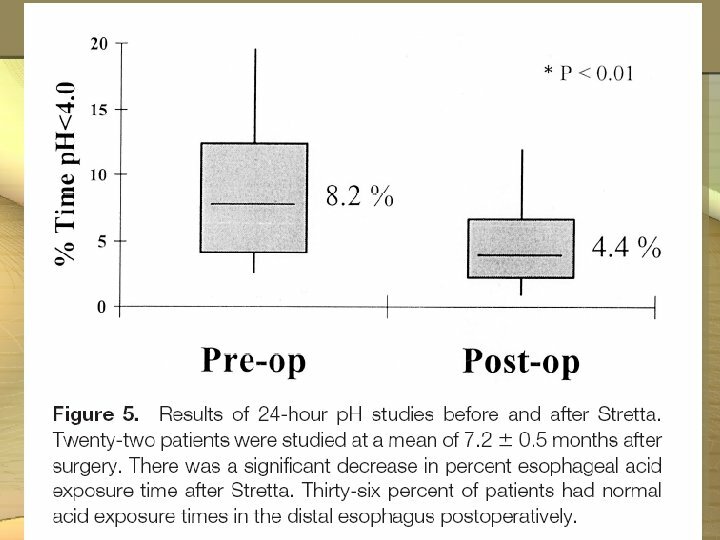 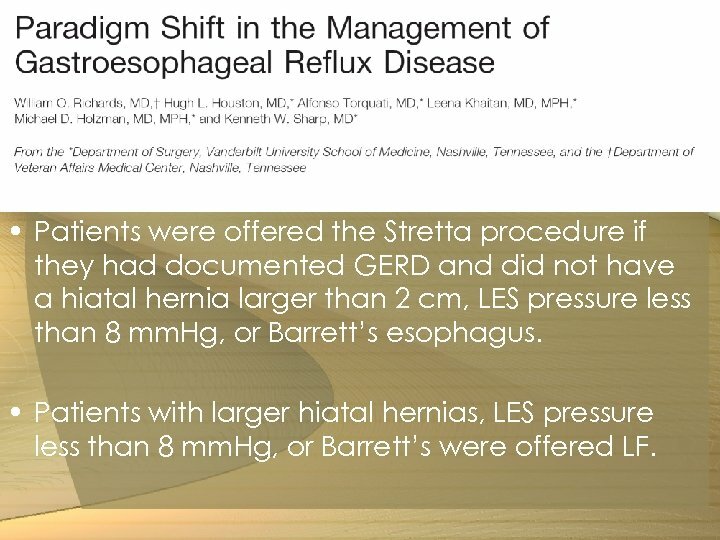 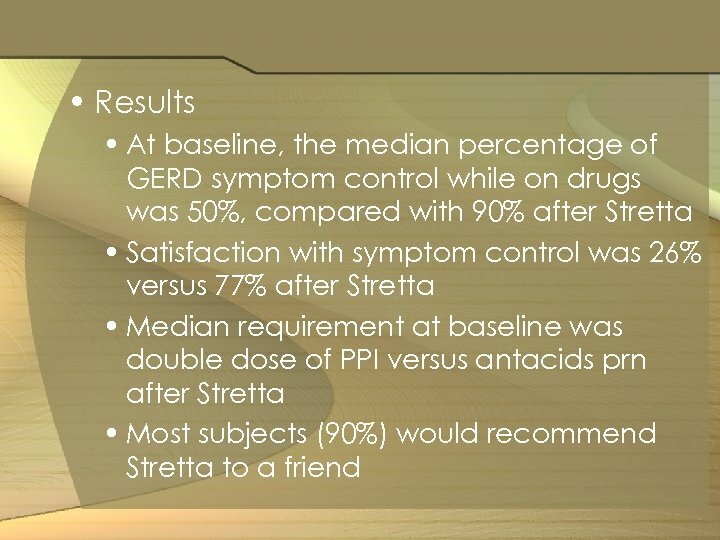 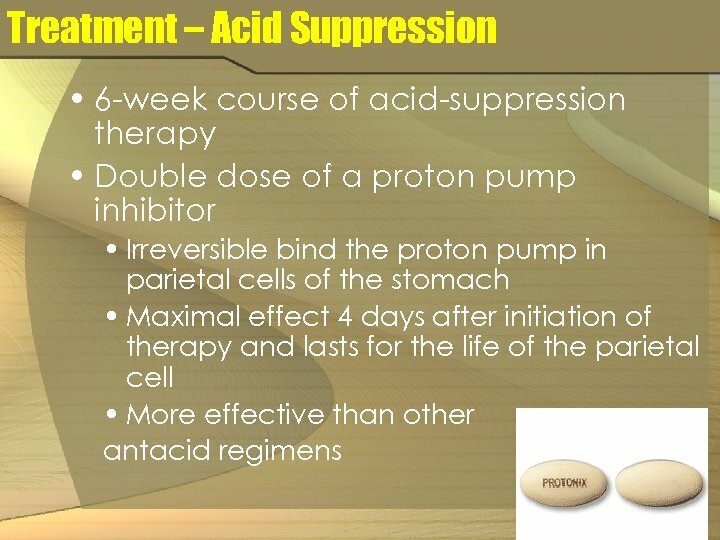 Stretta • Patients were offered the Stretta procedure if they had documented GERD and did not have a hiatal hernia larger than 2 cm, LES pressure less than 8 mm. 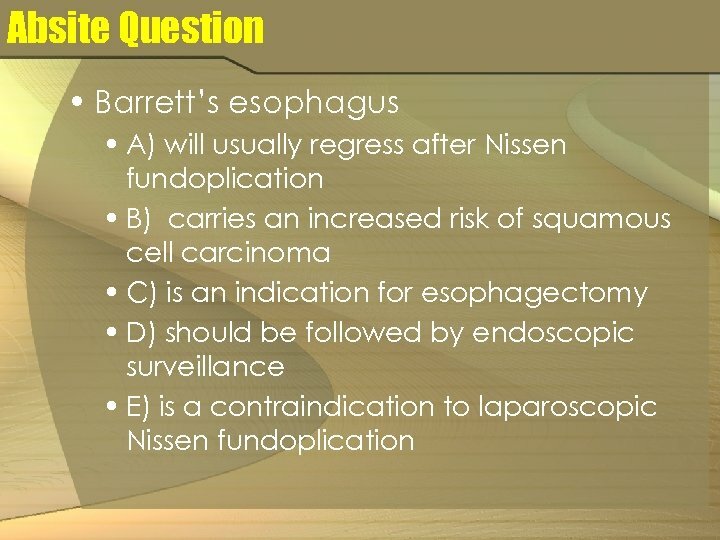 Hg, or Barrett’s esophagus. 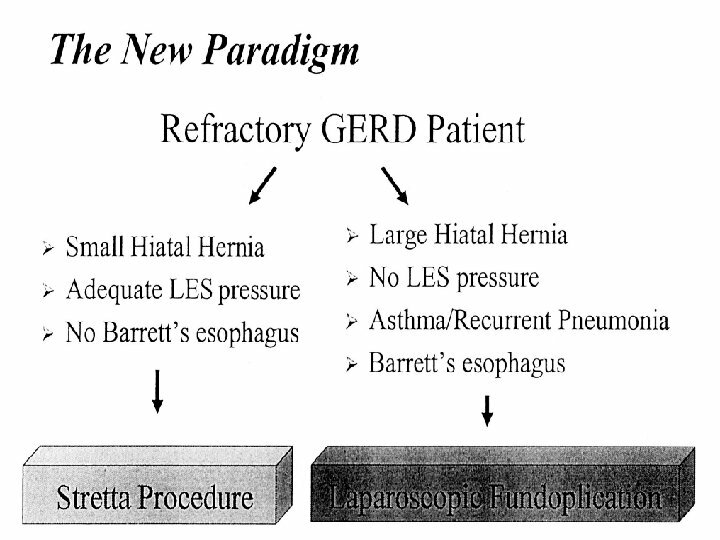 • Patients with larger hiatal hernias, LES pressure less than 8 mm. 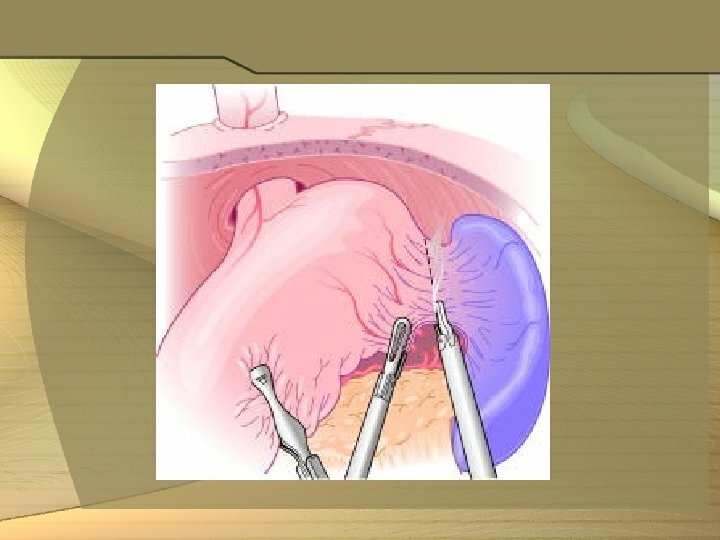 Hg, or Barrett’s were offered LF. 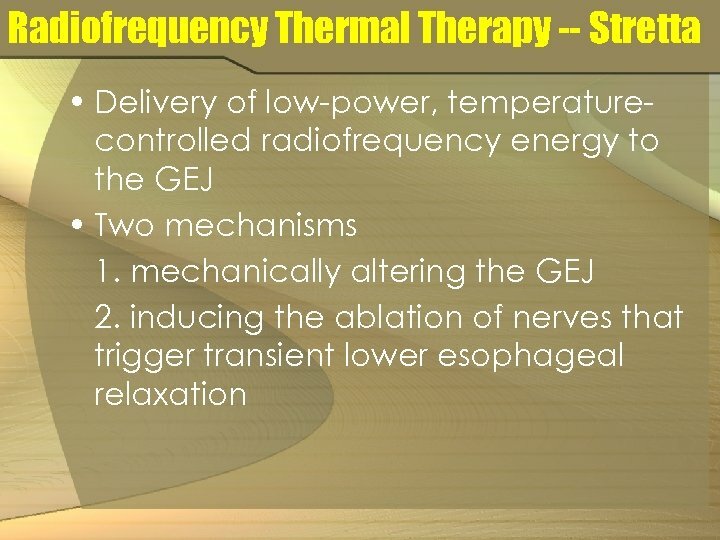 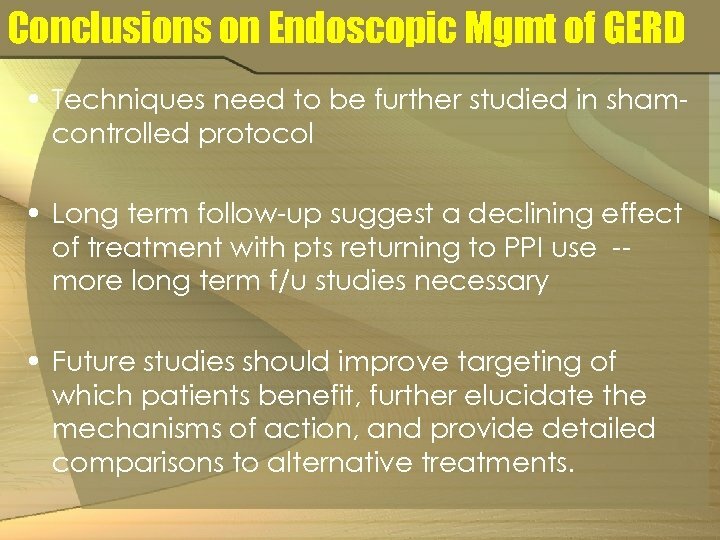 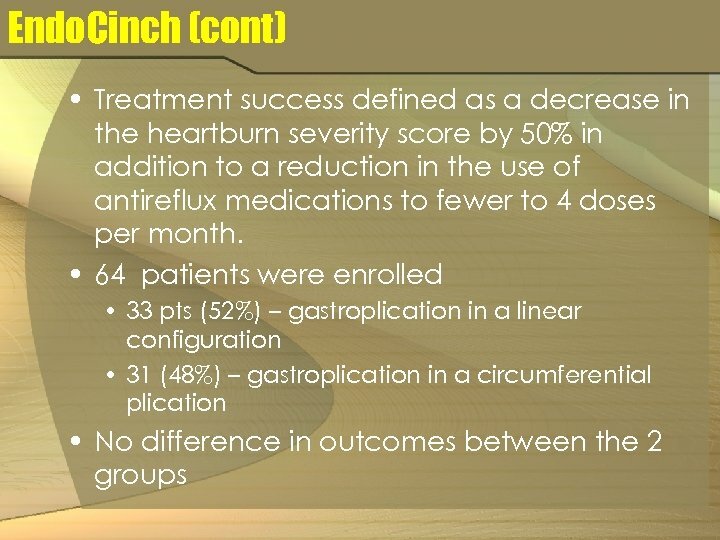 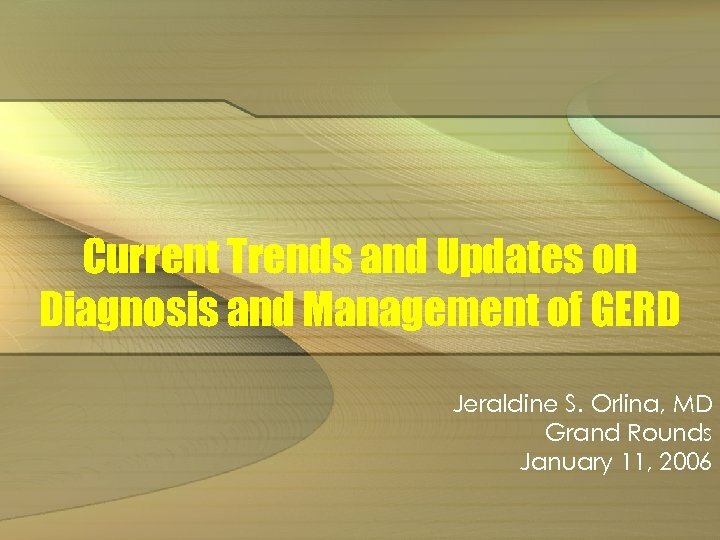 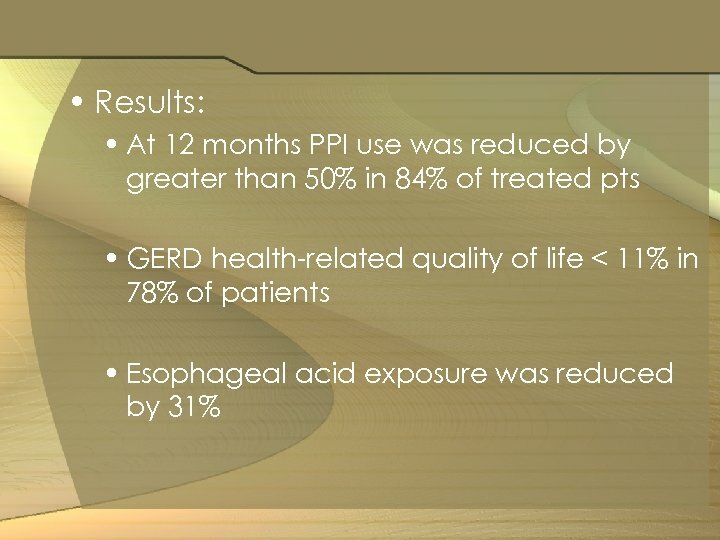 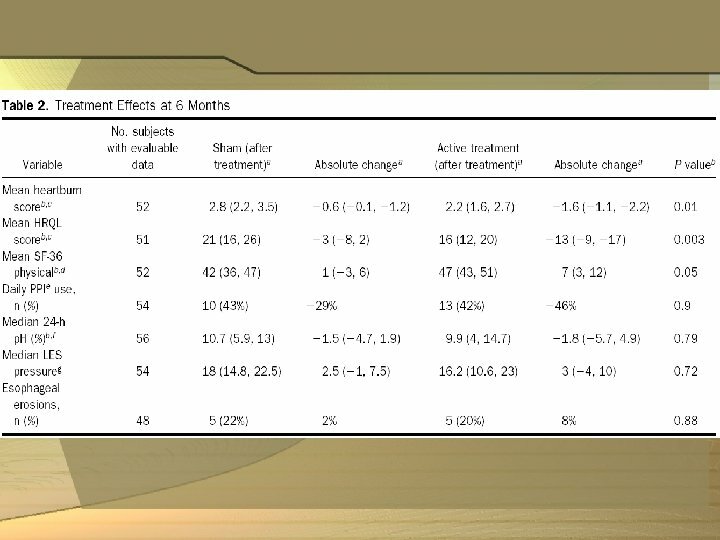 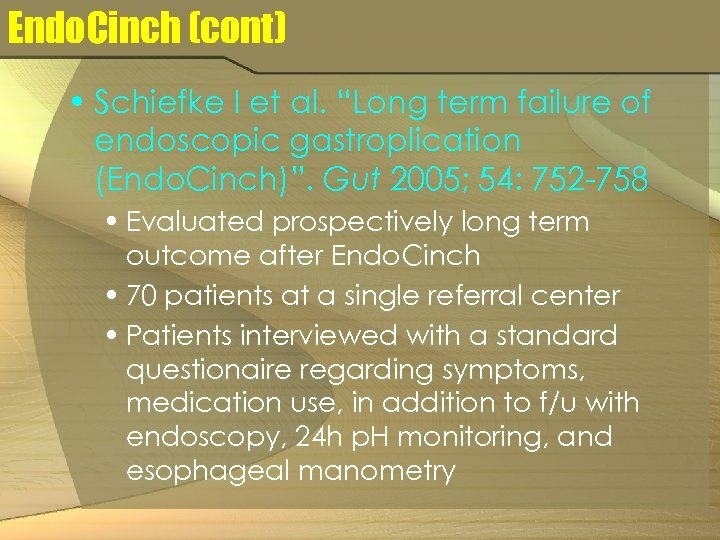 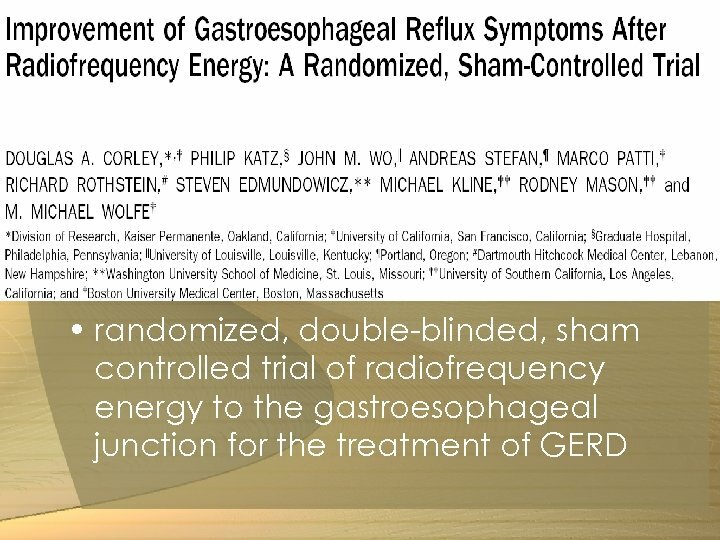 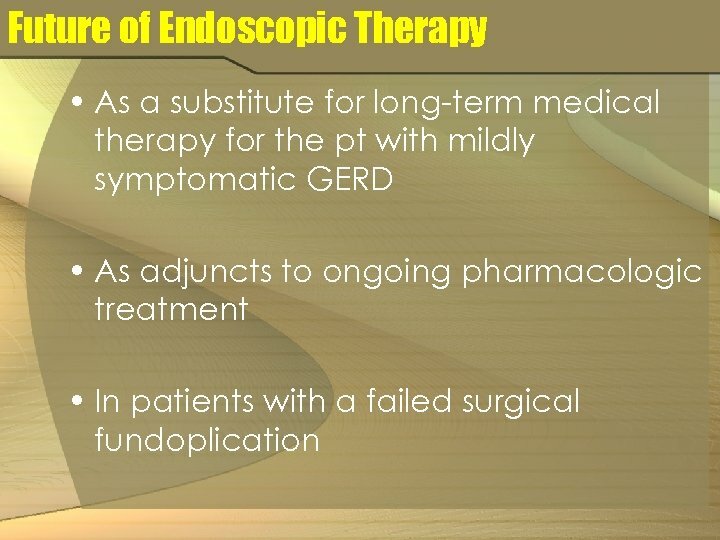 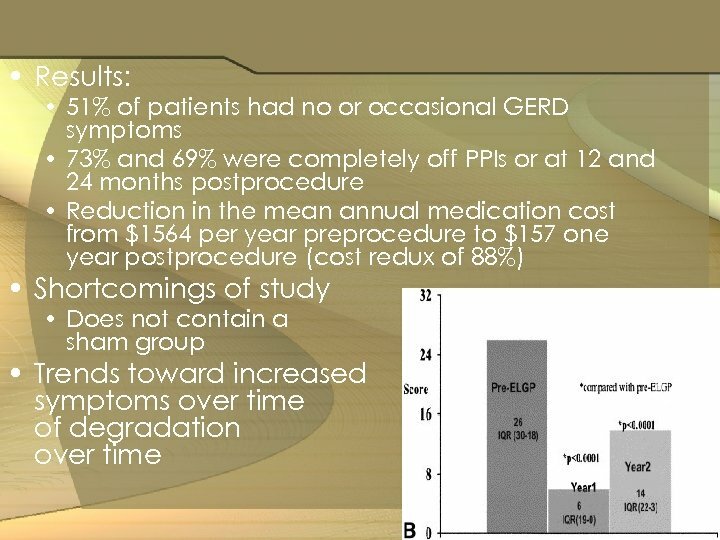 Conclusions on Endoscopic Mgmt of GERD • Techniques need to be further studied in shamcontrolled protocol • Long term follow-up suggest a declining effect of treatment with pts returning to PPI use -more long term f/u studies necessary • Future studies should improve targeting of which patients benefit, further elucidate the mechanisms of action, and provide detailed comparisons to alternative treatments.